Believes the kingdom is on earth now through the church although there is more to come (pp. 191, 251). As a matter of fact the future of the cosmos is being determined by the church (p. 229)—“Jesus played His part and then left. Now it is up to us” (pp. 233, 234, cf. p. 253). This is an inaccurate view on many fronts. Thinks Jesus was primarily rejected because He did not measure up to what was expected in a Messiah (p. 242). This is clearly not the full story. Believes that Jesus taught pacifism, disposal of wealth and apparently was not concerned about homosexuality (pp. 259). Misinterprets the story of the Prodigal Son, calling Jesus a prodigal son and the Father a prodigal God (p. 268). Terribly misunderstands the humanity of Jesus and leans toward open theism (pp. 270-271). It is important to understand that The Jesus I Never Knew is not a careful analysis of the biblical data concerning Jesus but rather the thoughts and insights the author has gleaned from numerous extra biblical sources in addition to the Gospels: movies, Catholicism, liberal theologians, secular philosophers, psychologists and novelists. As should be expected, the result is a collage of helpful insights and questionable and even errant ideals. 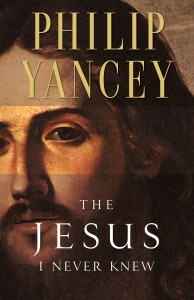 Discerning and well-read readers of the book might glean some value but most will not recognize that Yancey has not revealed the real Jesus but muddied the waters by turning to the wrong sources for his portrait of Him. In addition to those mentioned above the author draws from such authors as M. Scott Beck (pp. 53, 191, 204, 257) Kierkegaard (p. 76), George MacDonald (p. 77), psychologist, Eric Fromm (p. 158) and Rollo May (pp. 210-211), as well as liberation theologian Jürgen Moltmann (pp. 183, 253-254), Annie Dillard (p. 234), Salman Rushdie (p. 260), and Tony Campolo (p. 274). He often over-generalizes (pp. 23, 59, 86, 147, 259, 260, 266). He makes forced or inaccurate interpretations of Scripture (pp. 36, 43, 63, 76, 105-126). He over-emphasizes free will (pp. 78-80, 160, 174). The Jesus I Never Knew (Grand Rapids: Zondervan, 1995), 288 pp., paper 14.99 is interesting, well written, offers some needed corrections in how some perceive Jesus and provides some helpful insights. But there are too many out-of-balance comments and skewed views of Jesus to recommend this book.